کاظمی نجفی, سعید, ملکی, صادق, ابراهیمی, قنبر, غفرانی, محمد. (1396). تعیین مقاومت انفصالی اتصال منگنه ساخته شده با اعضای مختلف در قاب مبلمان راحتی. مجله صنایع چوب و کاغذ ایران, 8(1), 95-108. سعید کاظمی نجفی; صادق ملکی; قنبر ابراهیمی; محمد غفرانی. "تعیین مقاومت انفصالی اتصال منگنه ساخته شده با اعضای مختلف در قاب مبلمان راحتی". مجله صنایع چوب و کاغذ ایران, 8, 1, 1396, 95-108. کاظمی نجفی, سعید, ملکی, صادق, ابراهیمی, قنبر, غفرانی, محمد. (1396). 'تعیین مقاومت انفصالی اتصال منگنه ساخته شده با اعضای مختلف در قاب مبلمان راحتی', مجله صنایع چوب و کاغذ ایران, 8(1), pp. 95-108. کاظمی نجفی, سعید, ملکی, صادق, ابراهیمی, قنبر, غفرانی, محمد. تعیین مقاومت انفصالی اتصال منگنه ساخته شده با اعضای مختلف در قاب مبلمان راحتی. مجله صنایع چوب و کاغذ ایران, 1396; 8(1): 95-108. هدف از این پژوهش بررسی تاثیر نوع اعضای اتصال (چوب رشته‌های توجیه‌دار، تخته چندلا و چوب صنوبر)، طول نفوذ منگنه (۱۲و ۱۷میلی‌متر) و حضور چسب (با چسب و بدون چسب) بر مقاومت انفصالی اتصال ساخته شده با منگنه در جهت عمود بر سطح و لبه بوده است. اعضای اصلی و فرعی نمونه‌های اتصال در حضور و عدم حضور چسب به وسیله یک اتصال‌دهنده منگنه به هم متصل شدند و تحت بارگذاری انفصالی در لبه و سطح قرار گرفتند. نتایج نشان دادند که، اعضای اتصال، عمق نفوذ و حضور چسب تاثیر معنی‌داری بر مقاومت انفصالی اتصال ساخته شده با منگنه داشته‌اند. مقاومت انفصالی منگنه در جهت عمود بر سطح نسبت به اتصال‌های ساخته شده در جهت عمود بر لبه بیشتر بوده است. با افزایش طول نفوذ مقاومت انفصالی اتصال افزایش می‌یابد و مقاومت انفصالی اتصال‌های مونتاژ شده با حضور چسب نسبت به اتصال‌های مونتاژ شده بدون چسب بیشتر بود. اتصال‌های ساخته شده با چوب رشته‌های توجیه‌دار نسبت به دو نوع عضو دیگر عملکرد بهتری داشته است و در این میان اتصال ساخته شده با چوب صنوبر نسبت به تخته چندلا مقاومت بیشتری داشت. بالاترین میزان مقاومت انفصالی در جهت عمود بر سطح (N2326) و لبه (N1265)مربوط به اتصال‌های ساخته شده از چوب رشته‌های توجیه‌دار با حضور چسب و عمق نفوذ ۱۷میلی‌متر بوده است. Smardzewski, J., 2015. Furniture design, Springer International Publishing AG. Switzerland, 649p. Ebrahimi, Gh., 2006. Engineering design of furniture structure.Tehran University Publications, Tehran, 491p. (In Persian). Eckelman, C.A. and Zhang, J., 1995. Uses of the General Service Administration performance test method for upholstered furniture in the engineering of upholstered furniture frames. Holz als Roh- und Werkstoff, 53:261-267. Eckelman, C.A. and Erdil, Y., 2008. Joint Design Manual for Furniture Frames Constructed of Plywood and Oriented Strand Board. In: Proceedings of 1st International Furniture Congress Proceedings. October.14-17, Istanbul, p 266-268. Maleki, S., Faezipour, M., Ebrahimi, G.h, Faezipour, M. and Layeghi, M., 2012 .Investigation on bending moment resistance of L- shaped screwed cornerjoints constructed of plywood members. Iranian Journal of wood and paper Science Research, 27(4): 732 -742. (In Persian). Dai, L, Zhang, J. and Quin, F., 2007. Lateral and tensile resistances of glued face-to-face and end-to-face joints in pine plywood and oriented strand board. Forest Product Journal, 58(3):50-54. Maleki, S., Dalvand, M., Haftkhani, A.R. and Faezipour, M., 2013. The effect of adhesive types and dovetail fitting height on stress carrying capacity of Miter Frame corner joints constructed of particleboard and Medium Density Fiberboard (MDF). Iranian Journal of Wood and Paper Industries, 66(2):203-214. (In Persian). Kahvand, M., Omrani, P. and Ebrahimi, G.h., 2013. Determination of bending moment resistance of T-type joints constructed with wood biscuit. 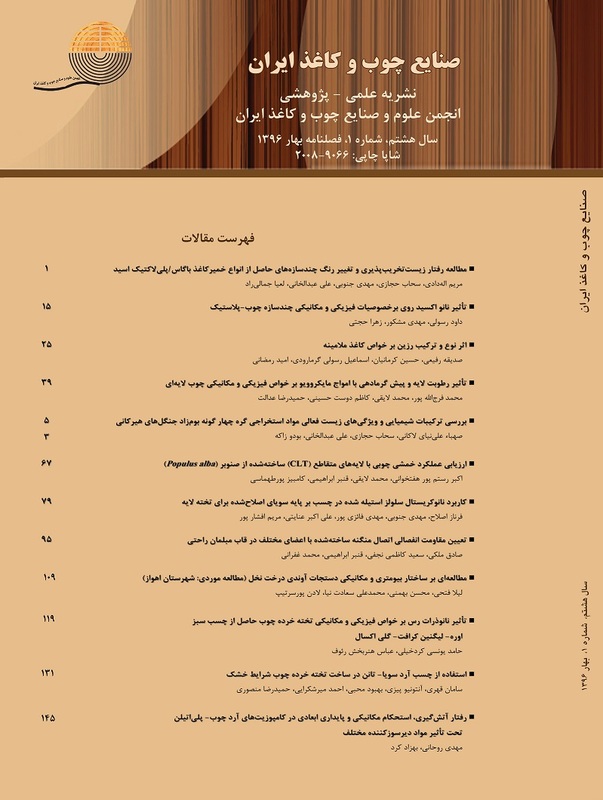 Iranian Journal of Wood and Paper Industries, 5(2):47-58. (In Persian). Altun, S., Burdurlu, E. and Kılıc, M., 2010. Effect of adhesive types on the bending moment capacity of Miter frame corner joints. Bioresources, 5(3): 1473-1483. Oktaee. J., Ebrahimi, G.h., Layeghi. M., Ghofrani. M. and Eckelman, C.A., 2013. Bending moment capacity of simple and haunched mortise and tenon furniture joints under tension and compression loads. Turkish Journal of Agriculture and Forestry, 38: 291-297. Eckelman, C.A., 1975. Screw holding performance in Hardwoods and particleboard. Forest Product Journal, 25(6):30-36. Taj, M., Kazemi Najafi. S. and Ebrahimi, G., 2009. Withdrawal and lateral resistance of wood screw in beech, hornbeam and poplar. European Journal of Wood and Wood Products, 67: 135-140. Zhang, J. and Skipper, L., 2005.Load-withdrawal displacement characteristics of staples in selected hardwoods. Forest Product Journal, 55(2): 71-80. Wang, S., Salenikovich, A. and Mohammad,M., 2007. Localized density effects on fastener holding capacities in wood-based panels. Forest Product Journal, 57(2):103-109. Erdil, Y.Z., Zhang, J. and Eckelman, C.A., 2003. Staple holding strength of furniture frame joints constructed of plywood and oriented strand board. Forest Product Journal, 53(1):70-75. Wang, S. and R.M. Knudson., 2002. Suitability of oriented strand board for upholstered furniture technical analysis. Forintek report. Canadian forest service value-added. 64 pp. Demirel, S., 2012. Static and Fatigue Performance of Oriented Strand board as Upholstered Furniture Frame Stock. Ph.D Thesis, Mississippi State University. Tu, C., 2010. Tensile, moment, and torsional resistance evaluation and prediction of mortise-and-tenon joints in wood-based composites. Ph.D Thesis, Mississippi State University. Malanit, P., Barbu, M.C. and Frühwald, A., 2010. Physical and Mechanical Properties of Oriented Strand Lumber made from an Asian Bamboo (Dendrocalamus Asper Backer). European Journal of Wood Products, 69: 27-36. Vlosky, R.P. and Wu, Q., 2001. A brief look at raw material usage in the furniture and cabinet industries in the southern United States. Forest Product Journal, 51(9):25-29. Shmulsky, R. and Jones, P.D., 2011. Forest products and wood science. An introduction, Sixth Edition. John Wiley & Sons, New York, 670 p.
 Meyer, K.l., 2001. Impact of strand geometry and orientation on mechanical properties of strand composites. Master’s Thesis, Washington State University. Wang, X., 2007. Designing, modelling and testing of joints and attachment systems for the use of OSB in upholstered furniture frames. Doctor of Philosophy, University of British Columbia. Standard Test Methods for Small Clear Specimens of Timber. Annual Book of ASTM Standard, D 143. 2000. Standard Test Methods for Plywood - Bonding quality, part 1, Iso 12466, 1999. Standard Test Methods for Standard Specification for Evaluation of Structural Composite Lumber Products, Annual Book of ASTM Standard, D 5456, 2013. Standard Test Methods for Evaluating Properties of Wood-Base Fiber and Particle Panel Materials, ASTM D 1037. 1999.